This post is sponsored by Disney Book Group. As always, all opinions are my own. Thirty years ago, I started Kindergarten. I can’t remember if I had dinner yesterday but I’ve somehow managed to remember my first day of Kindergartenvividly. As many of you know, I grew up in the Caribbean and it was a rainy morning. I remember my grandmother dropping me off and standing with a group of other kids in white shirts and blue dresses. As I stood at the back of the line, another kid named Alex stood next to me as my partner. His big sister asked me my name, I told her and she responded her name was Raine and smiled. I had never heard the name Raine before but I thought it was beautiful and of course, I would never forget meeting her on a rainy first day of school. This distracted me from my first day of school fears, her smile made me relax and her asking me my name made her brother talk to me too. I told my son this story recently because I realized that he’s a bit nervous about starting Kindergarten next week. Determine the cause of your child’s first day of school fears. The best way to solve a problem is to determine the cause right? Ask your child what makes he/she so worried about the first day of school. 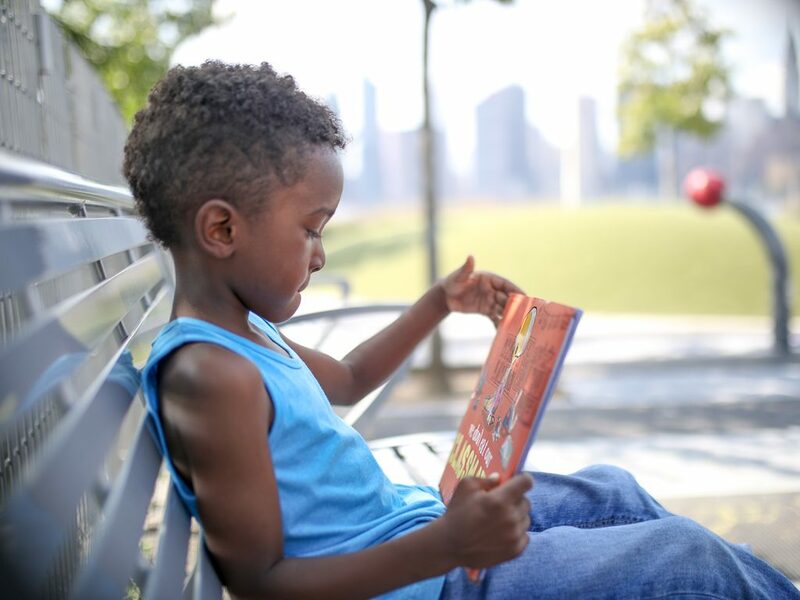 My son told me he will miss his Pre-K teacher, he grew really fond of her and she was really kind to him so I understand his fear of getting to know a new teacher. Fortunately, we’re attending an orientation with his new teacher today, so he will meet her before the first day of school. 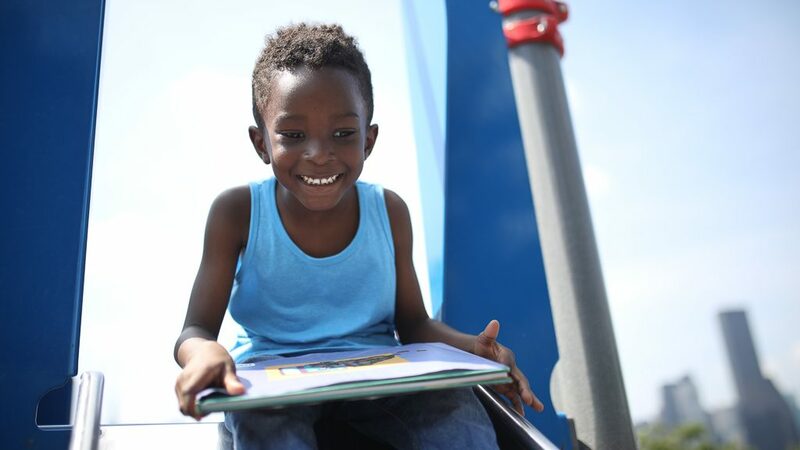 Help them through story books. 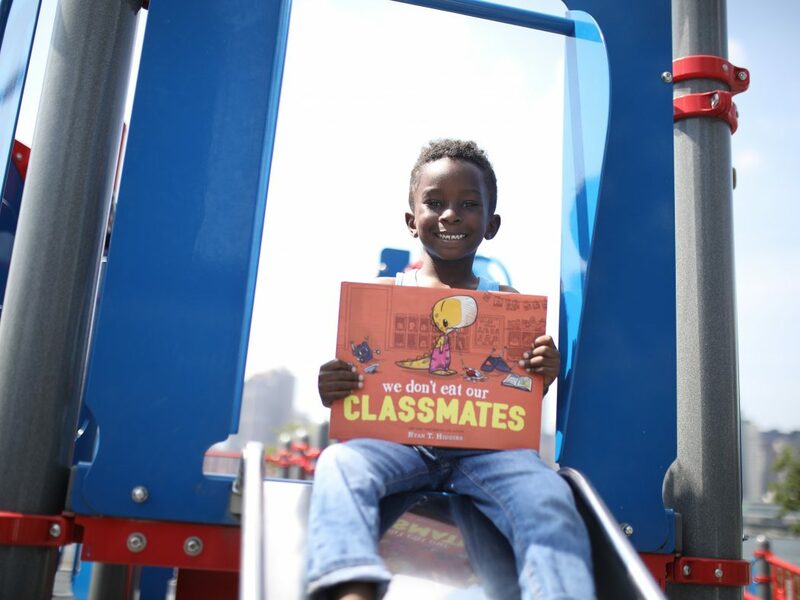 Books are a great way to teach kids life lessons, first day of school is no different. 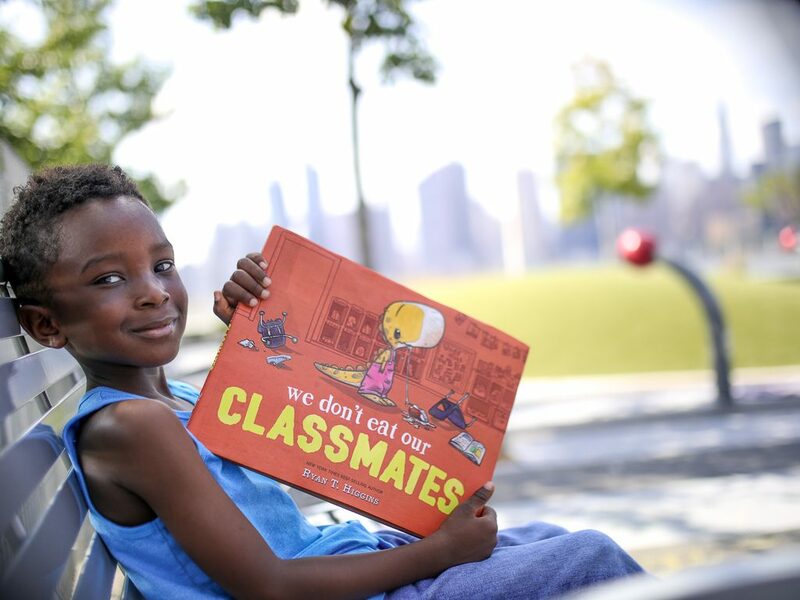 This summer, we got our hands on the recently released We Don’t Eat Our Classmates book by Ryan T. Higgins and I immediately added it to my toolbox to help ease my son’s fears. This story is all about a dinosaur named Penelope who eats her classmates causing them to distrust her and leading to her having no friends. It ends well though, Penelope learns her lesson and makes friends. 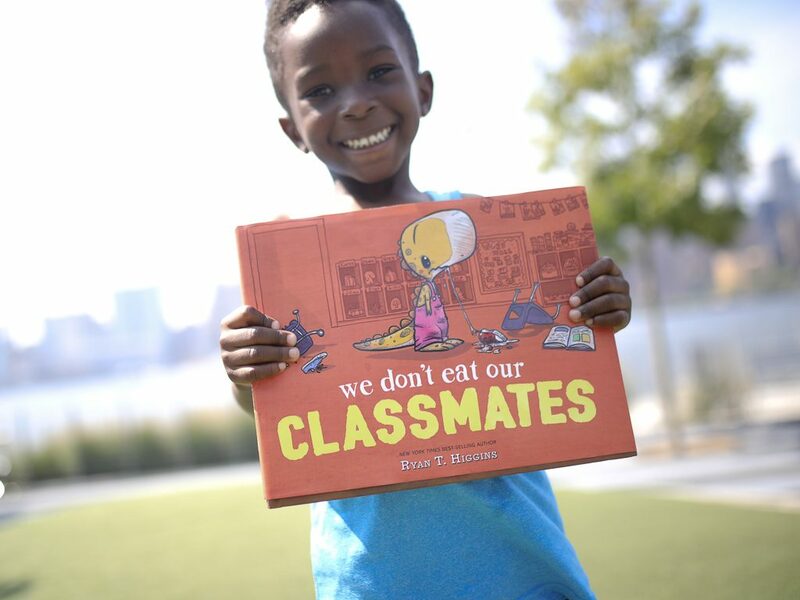 The book is hilarious, my son laughs hard whenever we read it and although he is one of the kindest kids I know, he is reminded that we’re treated the way we treat others. 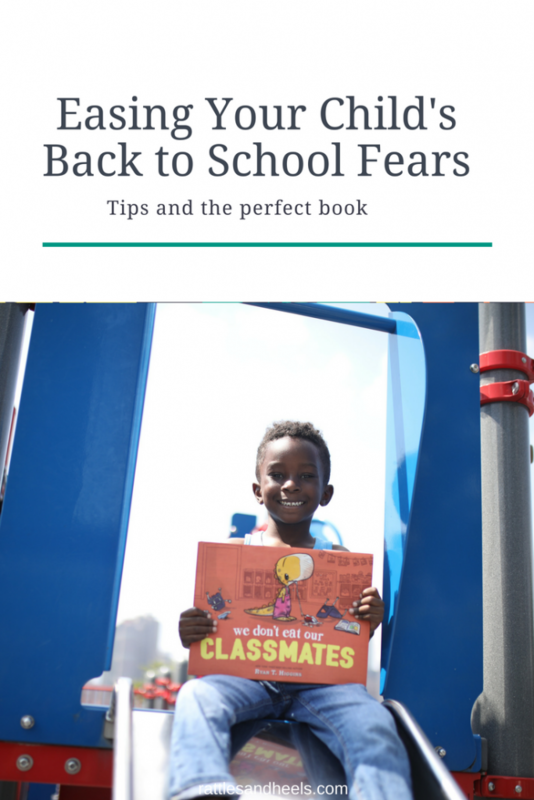 Whether or not your child is fearful of school, this is a great book to have in your home library for those rough days that may pop up during the school year. Let your child know that first day of school fears are normal. When my daughter was entering Pre-K she asked me if I thought other kids were nervous too and I let her know that they would be. Letting your child know that having some jitters is normal will help ease those fears. Work through your own anxiety. It’s no secret that the first day is often much harder for the parents than for the kids. If you feel emotional especially if your child is younger, try your best to not let your child know as this would make the day difficult for them. I hope these tips help you and your family get through the first day and week of the school year and more importantly that your child/children have a wonderful school year. What are your tips for calming your child’s first day of school fears?